Solar energy has evolved as a very important source of energy. Various technologies have been developed to harness the power of the sun. One such technology is solar photovoltaic cells. Solar cells take the irradiation of the sun and converts it into electricity. An array of solar cells and systematically arranged in modules to make a solar panels. Solar panels thus are used to convert take the solar radiation and convert it into solar energy. Solar panel absorb the solar irradiation and generate DC energy. 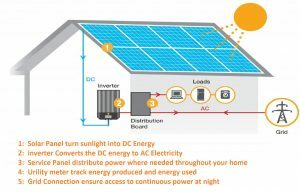 This DC energy is converted to usable AC energy with the help of an inverter. This AC energy is distributed using an electrical panel for domestic utility. A standard solar panel consists an array of cells , metal frame, glass casing and an insulating sheet. Silicon is a semiconducting material the absorbs irradiation and converts it to electricity. When light interacts with silicon it set the free electrons into motion, which initiates a flow of electric current. This is known as photovoltaic effect. A typical solar panel consists of a glass casing that offers durability and protection for the silicon cells. Beyond the glass surface is layer of insulation and protective back-sheet. This layer of insulation is critical as it protects the solar cells against the effects of temperature and humidity. Increase in temperature potentially decreases the cell efficiency, thereby decreasing the solar panel performance. Solar panels have an anti-reflecting coating that increases the absorption and allows the silicon cells to receive maximum sunlight exposure. We will discuss here about the grid-tied system and benefits of supply power to the grid using net-metering. A grid tied system is generally a system that is connected to the grid. Grid tieing is done basically to provide the inverter with a reference voltage and frequency for conditioning the output of the solar panels which is in DC form. In a grid tied system, the solar system supplies the base load , while grid energy is drawn to supply the peak loads. Similarly if more energy is produced by the solar system compared to the operational load, the excess energy can be fed back to the system for use elsewhere. Due to the general electricity deficit, power utilities are encouraging this feedback of power into the grid with the help of a bi-directional meter and compensates for the power fed. This is known as Net Metering .The utility generally compensates you for the power feed at a predetermined rate or by means of bill credits that shall be utilized in future. Storage of energy is a costly proposition considering the cost of batteries. Estimation and design of a off-grid system is also a tedious process. Grid-tied systems are more reliable as compared to a off-grid system. In case of inadequate panel performance due to fog etc., a grid-tied system will latch on to the grid power and keep the system functional causing no hiccups. The idea is to optimize the energy utility in case of grid-tied system. A grid-tied system allows power feedback to the mainline grid in case of excess generation and enhance the financial viability of the plant.